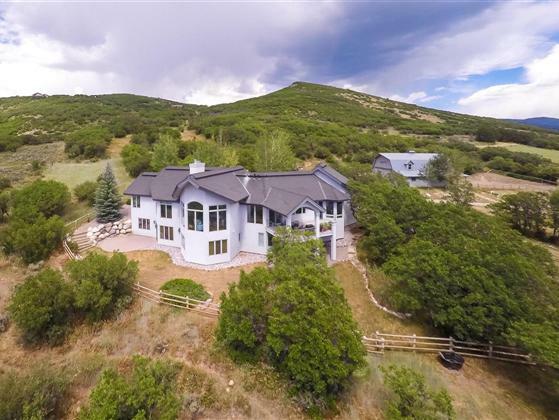 Serenity encompasses this captivating 35 acre estate with extensive views stretching more than 200° from the Ski Mountain to Sleeping Giant. This incredible property is highlighted by a 4 bedroom, 5,068 sq. ft. custom home which was brought to life through the vision of the owners and architect Jonathan Faulkner. Upon entering the home, you’ll instantly notice the attention to detail throughout with hardwood floors, multiple fireplaces, and floor-to-ceiling windows with pastoral views of Sleeping Giant. The great room offers a spacious place to relax warmed by a stone gas fireplace after a long day in the outdoors. The formal dining room includes built-in cabinetry, buffet counter, and access to the partially covered deck with outdoor seating for al fresco dining. The gourmet kitchen is open and airy with granite counters, center island cooktop, large pantry, maple wood cabinetry, and a generous breakfast nook as well as a second entrance to the deck. There’s a private, main level master suite with walk-in closet, and an attached bath with jetted tub, steam shower & toe-kicker heater. An office on the main level is a private sanctum with custom cabinetry. The main level has electrostatic air cleaning and dehumidified air as well as a hot water circulating system for instant hot water. The lower level was created with family and guests in mind with a family room that has a wood burning fireplace, wet bar and three guest bedrooms. A large finished storage area also has the potential for an additional bedroom or game room. The 2 ½ attached garage has hot and cold water and entran heating. The barn doubles for equipment storage with space for an RV, tractor parking, heated tack room, 3 stalls and 8-10 tons of hay storage in the hay loft. Outside, you’ll find a 70’ x 120’ riding arena, beautiful landscaping, and walking trails on the property that is fenced and cross-fenced. Only 8.5 miles to downtown Steamboat Springs and bordering public land, you will find your special place at Elk River Mountain Ranch. The Elk River area is located northwest of downtown and follows the Elk River to Clark, about 17 miles from Steamboat. This area is largely comprised of 35-acre parcels but includes a mix of single-family homes on small plots, ranchettes, and cattle ranches made up of several hundred acres. There are some smaller subdivisions, rural properties, working ranches and guest ranches, most on larger acreage parcels. The “Elk River Area” extends up CR 129 until you get to the small community of Clark, Colorado.